"Beverly Hills Cop" helped launch the genre of action-comedy, and is chock full of local L.A. locations, from the real Rodeo Drive to Koreatown and Pasadena - and from art galleries to strip clubs. It's hard to imagine anyone in the lead role of 'Axel Foley' except Eddie Murphy, but they originally had Sly Stallone in mind, as a straight action flick with little comedy involved. Sly turned it down - something he no doubt regrets today, since Beverly Hills Cop still ranks as one of the top 40 highest-grossing movies of all time (when you adjust the dollars for inflation). Tracking down filming locations for a 30-year-old movie isn't the easiest thing in the world, since over the years, some of the original locations have vanished, and most of them have changed significantly. But fortunately, I had a lot of help on this one from Chas Demster, a fan who tracked down many of these locations, and from the Production Designer's commentary on the DVD. This movie is about a Detroit cop who comes to Beverly Hills to investigate his friend's murder. So the beginning of the film is supposed to take place in Motown. And some of it does - most notably the lengthy police pursuit / chase scene that sees 'Axel Foley' (Eddie Murphy) hanging onto the back of a truck while it careens wildly through the streets of Detroit. But the producers don't even wait until Eddie's out of Detroit before switching to L.A. locations. Remember Eddie's Detroit apartment, where he meets with his old buddy, 'Mikey' (who has just been released from prison), and where that friend is mercilessly gunned down by the movie's villain? Well, that wasn't really in Detroit. The apartment building is actually located near downtown L.A., in a seedy part of town about three blocks west the Harbor (110) Freeway and about seven blocks east of MacArthur Park, at the southwest corner of Witmer Street & Ingraham Ave. - just a block south of Wilshire Blvd. The building he parks in front of is the one on the southeast corner of Witmer & Ingraham Ave. But as he gets out of the car, he appears to be heading to the building across the street, to the building at the southwest corner of Witmer & Ingraham, where his apartment is supposed to be located. 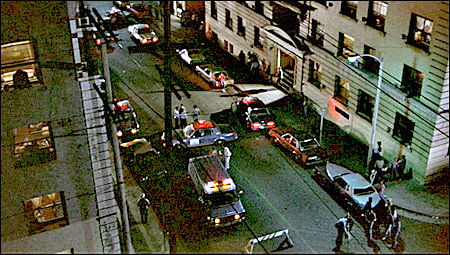 That same building is seen again later (see the photo above), after the cops swarm in to investigate Mikey's murder, in a scene where Eddie's Detroit boss warns him to stay away from the case, and Eddie asks for vacation time. 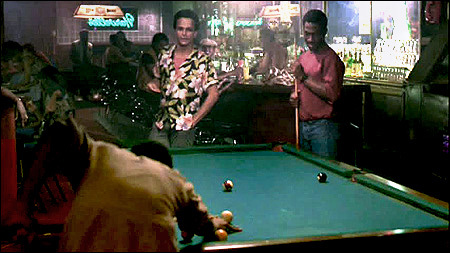 We also Eddie & Mikey playing pool in a dark bar that's supposed to be in Detroit - but isn't. 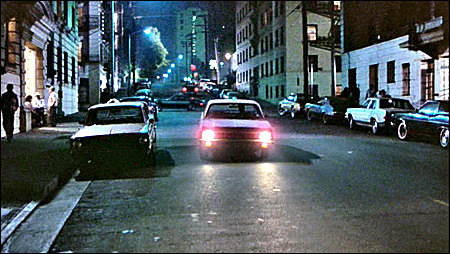 This scene was actually shot on the West Coast, a few blocks from the beach. The bar is called Harvelle's, and it's located at 1432 4th Street, in Santa Monica. The same etched-glass portraits (seen in in the photo above) still hang behind the bar. Next, we see Eddie in Beverly Hills, driving his crappy blue Chevy Nova down its palm tree-lined streets and taking in the sights. For much of this drive, he's heading west on Sunset Boulevard. 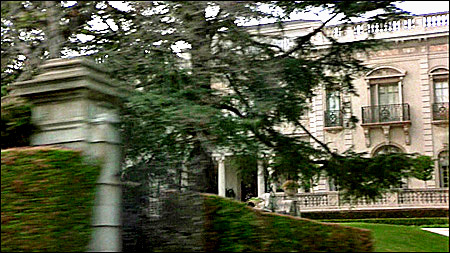 One of the Beverly Hills mansions that Eddie looks at (seen above) can be found on the north side of Sunset Blvd, between E. Elm Drive (on the west) and N. Palm Drive (on the east) - and between both ends of the U-shaped Mountain Drive. It's about two miles east of the Beverly Hills Hotel. 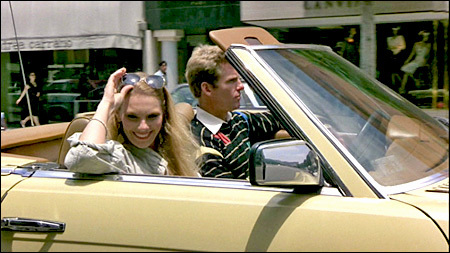 Next, we see Eddie driving down Rodeo Drive, in Beverly Hills. The camera focuses on the street sign at the corner of Rodeo Drive & Brighton Way. The camera then shows us the bronze signs of several well-known shops that are located on Rodeo Drive, including Louis Vuitton and Fendi. These bronze plaques were located on the west side of Rodeo Drive, on the walls of the Rodeo Collection center, at 421 Rodeo Drive. 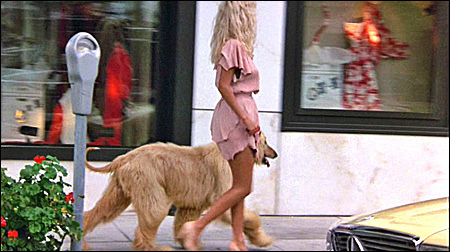 When Eddie sees a Beverly Hills woman walking her dog (her hairstyle matches the dog), she's walking past the Nina Ricci boutique, which was at 273 N. Rodeo Drive. (on the west side of Rodeo). 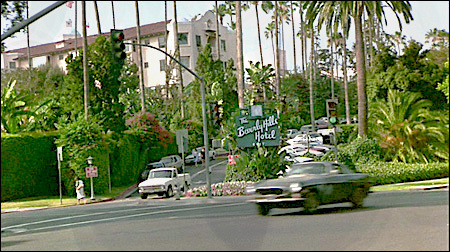 The movie was filmed before Two Rodeo was built, the posh Old World "street" that anchors the southeast end of Rodeo Drive. Many of Rodeo's best shops moved into Two Rodeo shortly after it was built in 1990, so many addresses changed. And other shops seen in the movie, such as Nina Ricci and Andrea Carrano, simply aren't there at all any more.